"Trust Your Memories to Us"
A monument is the perfect way for your family to honor the memory of a loved one. We will discuss your options with you and come up with the perfect design. Our company offers a range of different on site services for memorials including letter engraving and raising services. Come to your locally owned & operated memorial experts. 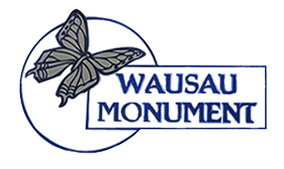 Wausau Monument Inc been serving the Wausau area for over 100 years. What’s kept us in business is our commitment to customer satisfaction & quality workmanship. Contact us with any questions you may have. Our staff have are knowledgeable and are here to guide you through all your optioins. We will help you decide on the best products for your needs.